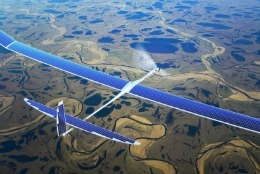 Google is testing solar powered drones to provide high performance internet, as part of the technology giants SkyBender project. The California-based company said the project will deliver 5G internet with the potential of being 40 times faster than its 4G predecessor. The California-based company said the project will deliver 5G internet with the potential of being 40 times faster than its 4G predecessor. Google is running the tests in New Mexico, where the firm rents a facility from private space travel company Virgin Galactic.